Salvage crews have removed a yacht that ran aground last week on a reef adjacent to Kaloko-Hono­ko­hau National Historical Park. 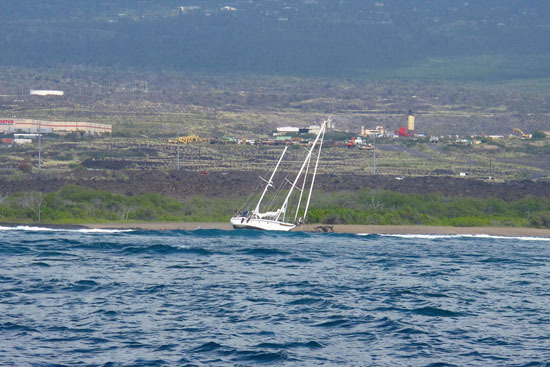 The 47-foot, $500,000 yacht named The Corsaire reportedly was stolen Oct. 13 from Honokohau Small Boat Harbor. Authorities said a Big Island man allegedly boarded the yacht with a guitar and other luggage and guided the boat out the harbor. He made it about three miles before running aground on a reef near Aimakapa Fishpond. The man was arrested and charged with felony theft. State and federal crews – including staff from the park, state Department of Land and Natural Resources and the U.S. Coast Guard – removed fuel and oil from the yacht last week and attempted to tow it off the reef late last week, a DLNR spokesman said. The boat, which suffered a large hole in the hull, was towed out to sea and sunk southwest of Honokohau Harbor, he said. The yacht was insured, the spokesman said, and that covered much of the recovery operation. The incident remains under investigation by the state Department of Land and Natural Resources.